Tony Molina follows The Trough (5.4), a classic route on Tahquitz Rock that is a great introduction to multi-pitch rock climbing. 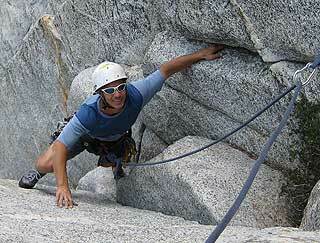 We offer guided climbs of Tahquitz Rock by appointment. Many climbers realize that with a skilled, professional guide they can optimize their recreational time and experience greater levels of difficulty with a higher level of safety. Working individually with a guide is the fastest way to improve technique. No matter your level, Joshua Tree and Idyllwild offer a wide range of classic, enjoyable, and challenging routes to choose from. Available to individuals or small groups, guided climbing is essentially private instruction, and can be scheduled to accommodate your agenda. If you have a specific climb or goal in mind, let us know. We'll design a program for you to get there. That's what guided climbing is all about. We can arrange group rock climbing outings for all ages and abilities. If you have a group of 6 or more, you can schedule a private group outing anytime you wish at a discounted group rate. We can customize the itinerary based on your group's experience level. 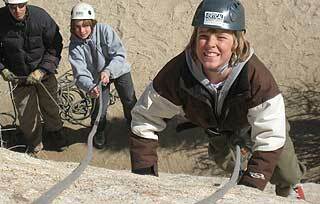 Joshua Tree offers a wide variety of rock climbing sites that are ideal for group rock climbing instruction. We have many areas available to us at Joshua Tree that can accommodate a wide range of ability levels. We specialize in group rock climbing instruction, including family outings, church groups, boy scout groups, and corporate team building. Contact us to discuss planning a group rock climbing experience.